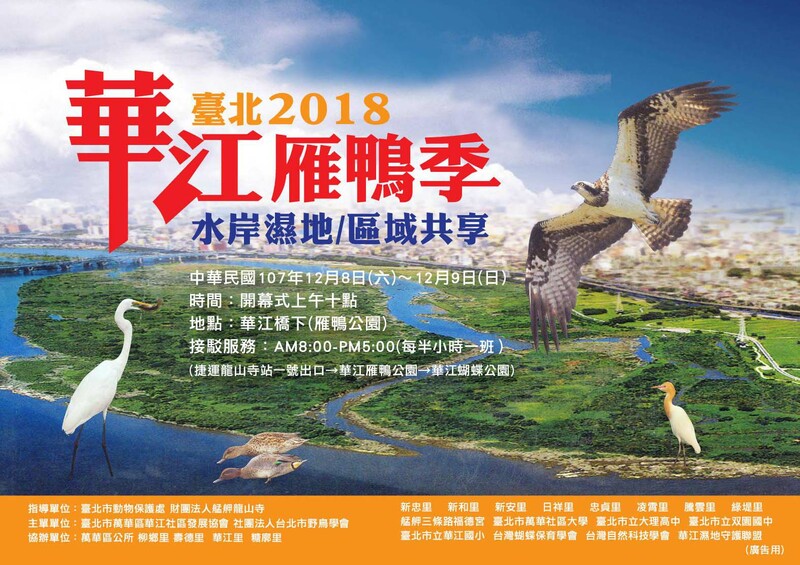 The Animal Protection Office (APO) has joined hands with the Wanhua District Huajiang Community Development Association to organize the 2018 Taipei Huajiang Waterfowl Season. The event will take place at the Huajiang Waterfowl Nature Park during the weekend of December 8. The Taipei Huajiang Waterfowl Season will comprise stage performances, carnival, waterfowl ecology tour, and interactive games to bring participants closer to both the surrounding wetlands and life in the local community. Economic Development Commissioner Lin Chung-chieh pointed out that Huajiang Waterfowl Nature Park and Taipei City Waterfowl Protection area is an important stop for migratory avian, with thousands of birds flocking to the area during April and September each year. As of the end of October 2018, records indicate that a total of 5485 birds spanning 87 species have been reported in the Huajiang area, including garganeys and Indian spot-billed ducks. Through the long term partnership between the city government and the private sector, the surrounding areas of Huajiang wetlands has become an important field boasting rich ecology within Taipei City. For the event, the Wild Bird Society of Taipei will be setting up telescopes on the birdwatching platform of the park to allow the public to have a close-up look at these shy birds, with experts offering guides and tips on avian observation to educate visitors on wildlife conservation and environmental protection. The organizers have also arranged for shuttle buses to transport visitors between the park and Longshan Temple. The shuttle runs from 8 AM through 5 PM on the event days, with a service every half-an-hour. The stops of the shuttle include MRT Longshan Temple Station (Exit 1), Huajiang Waterfowl Park, and Huajiang Butterfly Park. For more information, please visit the Chinese website of APO (https://www.tcapo.gov.taipei/) or the Facebook fan page of DOED (https://www.facebook.com/doed.taipei/).